Even though I had backpacked the North Fork earlier in the season (Spring trip report), I was still excited to see the 14,000 foot tall Palisades towering above the turquoise lakes minus the mosquitoes and icy wind characteristic of early season backpacking. Permits are reservable online at Recreation.gov. 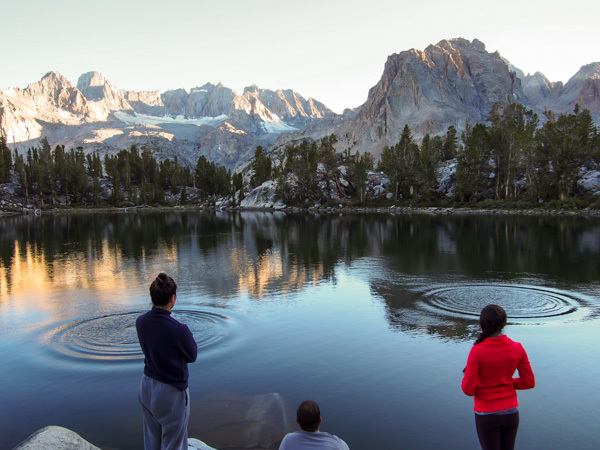 I’d argue that this is the most popular backpacking trail in all of Inyo National Forest, so you’ll want to book as early as possible, which is six months for this trail. In the afternoon we arrived at Big Pine Campground and set up camp at spots #15 and #19. Being a summer weekend, the campground was filled completely, and there was a 2 night minimum stay. While we finished off a total of 3 bottles of wine by the river, we enjoyed the company of two pheasants who followed us around the entire time. That evening we hung around the fire eating banana boats at camp site #9, by far the best site in the campground. The next morning we packed our bags and headed to the overnight parking lot about a mile from the trailhead. Instead of taking the dirt trail leading up the mountain directly from the lot, we decided to walk along the shaded road along the river to the true trailhead. At the true trail head ready to begin! 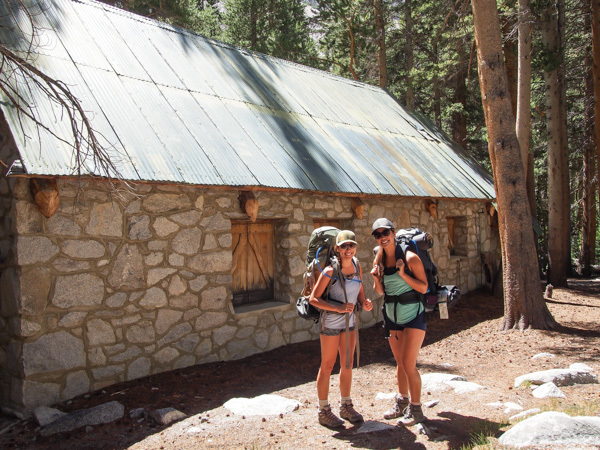 After walking along the river and passing the horse stables at 7800', the trail began its steady climb. After a mile and some steep switchbacks, we crossed first falls at 8400'. We took the shorter and unmarked upper trail, even though it was more exposed. This portion of the trail was quite impressive as the dirt path gradually ascended as it cut across the mountain. After rejoining with the lower trail after 0.7 miles and now at an elevation of 8720', we entered Inyo National Forest and rounded the corner at an impressive waterfall cascade (Second Falls). Continuously climbing upward, we passed a ranger station that used to be actor Lon Cheney's cabin. It was 3.4 miles until the junction that marks the beginning of our semiloop and an additional 1265' to climb. It was a relief to finally spot First Lake, at 9961', and it definitely seemed more turquoise than when I saw it several months ago. We decided to not leave the trail and instead head straight to Second Lake (10059'), where we would have lunch. Click here for my favorite lunches for backpacking! After lunch it was a short hike to Third Lake (10249'), where many of the great campspots were already taken. A passing hiker suggested we head to Fourth Lake, which was only a 20 minute hike and saw much less traffic. We decided to explore the southern shore of Third Lake and eventually found a decent spot with a view of Temple Crag above the water. After dropping our packs, we all quickly headed down to the lake to jump in while still warm from our hike. Don't let the color of the lake fool you..the water was frigid! The milky turquoise color of the lake is due to the glacial powder carried from the melting glacier. That night we laid out and watched the milky way appear directly above Temple Crag. Even though the peak of the Perseids Meteor Shower was only a couple days ago, we still saw tons of shooting stars. Everyone had difficulty sleeping this night, perhaps it was due to the gusty wind throughout the night. The next morning we packed up and headed up to Summit Lake (10900'). It was only a 700 foot climb in about 2 miles, so we quickly reached our destination and had set up camp at the best site by 11:00AM. We were glad to not have headed up to Fourth Lake to camp the previous date, because the only campspot sitting on a peninsula jutting out into the lake was taken. We decided to pack our day bags and head back down to Fifth Lake (10787'). Following the trail back to the western shore of Fourth Lake, we took an off trail up the ridge to the west to emerge above Fifth Lake. We crossed a log pile onto a small rock island and spent the rest of the day relaxing here. The boys found some fishing line and bait and fashioned a hook out of a bobby pin in hopes of catching some fish. The line was too brittle and snapped on them, but it was an entertaining afternoon. 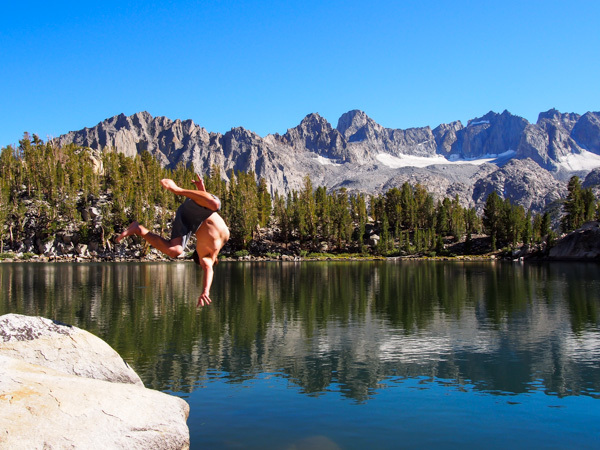 After the short and easy hike back up to Summit Lake, we decided to go for a swim. The water up here was much warmer and more relaxing to swim in. That night we feasted on the rest of our food, trying to finish it off before our hike out the next day. We were all completely stuffed with mashed potatoes, chicken rice, and cheddar broccoli rice. That night we decided to return to our swim rock with our sleeping bags to lay out and watch the stars one last time. The stars were so clear and bright that my first starry night photo turned out alright. At one point we heard our peanut butter wrapper get blown up and off the rock. When we went looking for it, we realized a mouse had snatched it and was furiously working to extract the last licks of delicious nut butter. The next morning we all got up at 6AM to watch the promising sunrise. Normally I have a hard time getting up early, but not when I'm backpacking in the mountains! The sunrise above Summit Lake did not disappoint. The entire range of the Palisades slowly began to glow from a deep orange to a golden yellow. The lake was completely still in the morning, making for great photos. It wasn't long until all of the jumping fish ruined the glassy reflection. It was a 0.4 mile hike back to Fourth Lake, and we couldn't find the trail that skirts around the eastern side of the lake, so it was another half mile around the western shore. It was a flat hike to Black Lake (10649'), which we briefly stopped at to enjoy before getting back on the trail. It was 1.5 miles from Fourth Lake till the end of the semi-loop. It was an easy hike out as everybody was eager to sit down to a large hamburger and fries. When we got to the true trailhead, a gentleman was nice enough to drive me back to the parking lot, saving me an extra mile. Next time we see any hikers headed to the overnight lot, we will be sure to pay forward the favor!